TOKYO -- In the race to build cars with digitally connected services -- such as ordering coffee on the dashboard display -- Toyota Motor and Nissan Motor risk being held back by their home market. In contrast to vehicle buyers in the U.S. and Europe, Japanese consumers are reluctant to pay for such features. That's resulted in only 10 percent of cars on Japan's roads having embedded connectivity, compared with 49 percent in the U.S., 31 percent in Europe, and 20 percent in China, according to consultancy SBD Automotive. The threat to the Japanese automakers -- which control almost all of their home market and do a major part of their product development there -- is that competitors pull ahead as global demand for connected services keeps increasing. Rivals including General Motors are betting on connectivity for new revenue streams as buyers in the U.S., Europe and China embrace on-board shopping, entertainment and customized coupons. "For Japanese carmakers there's a big risk," said Masanori Matsubara, a senior analyst at IHS Markit. "They have to compete on a global level with the Detroit Three and the Germans, which have experience and have built the ecosystem and service platform." Instead of choosing connectivity services built into the dashboard, Japanese drivers prefer to hook up their smartphones to the car's systems to, for example, listen to streamed music. That means the data flows through the smartphone provider, typically Apple or Google, denying the car companies a massive opportunity. The data generated from smarter and connected cars will create a market as big as $750 billion by 2030, according to an estimate by McKinsey & Co.
"There needs to be customer pull," said Lee Colman, an analyst heading connected-car research at SBD Automotive. "The carmakers don't want to offer those services unless they know the customers will actually tick 'yes' in the optional box." The risk is akin to what happened to mobile phones a decade ago, when Japanese brands missed an industrywide shift to smartphones. While flip phones have almost vanished elsewhere, they still have a remarkable presence in Japan as they meet basic-usage needs and are easy for elderly consumers. The phenomenon has become locally known as "Galapagos," after the islands with distinct flora and fauna, and flip phones are also now referred to by that name. 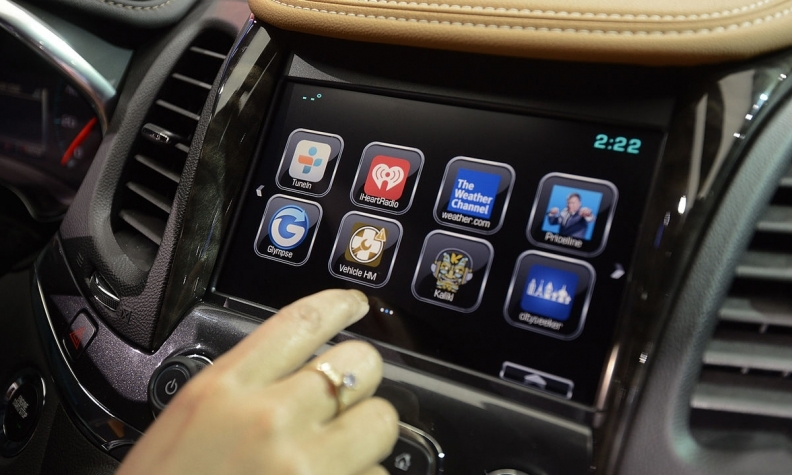 In connected services, GM is the undisputed leader after pioneering its OnStar system in Cadillacs in 1996. Initially designed for emergency and security purposes, OnStar now allows drivers to reserve a restaurant table and suggest discounted rates at a nearby gas station through the dashboard infotainment system. GM doesn't break out financial results for OnStar, but the unit has been profitable for a long time, according to people familiar with the matter. In China, Lynk & CO is among local brands touting their latest connected features at the Beijing International Automotive Exhibition that kicks off April 25. Li Shufu, the billionaire owner of Volvo Cars, unveiled the Lynk & CO marque last year to target urban young buyers with always-on Internet and instant ride-sharing with the push of a button. The European Union is making connectivity mandatory for safety purposes, requiring new cars to be equipped with technology called eCall starting in April. In the event of a serious accident, eCall automatically sends emergency services to the vehicle's location, even if the driver is unable to make a call. There hasn't been a push from authorities for a similar system in Japan, and the local carmakers have failed to come up with services that would draw users, according to Matsubara of IHS Markit. A system helping the driver to avoid congestion, or services aimed at the elderly could eventually prove popular, said Colman at SBD Automotive. "What could be the Japan-originated connected service that would capture local demand is the billion-dollar question," Colman said. "It will come down to what problem you are trying to solve." Toyota has started a service called T-Connect, which provides drivers in Japan with real-time traffic information and lets them book a restaurant via a human concierge. But the service hasn't won over many customers yet, said Akio Yamamoto, a general manager at Toyota's in-house company in charge of connectivity related innovation. "We are scratching our head to come up with ways to improve T-Connect," Yamamoto said. "But we are also considering various approaches to provide good connected services to customers if T-Connect doesn't win acceptance by the market." Toyota started its connectivity company in 2016 and aims to have 70 percent of new cars on the system by 2020. Nissan said last month it plans to offer connectivity for all new Nissan, Infiniti and Datsun cars sold in key markets by 2022. Honda Motor hasn't announced a target, but has said it's working with SoftBank to develop new connected technologies. "The turning point will be around 2020-2025," said Takao Asami, Nissan's senior vice president in charge of research. "If we miss that period, we will have a big problem."